Sibyl McNulty has been a member of Sunnyhill since 1994, when she relocated from the east side of the city to Mt. Lebanon with her husband Paul, her two teenagers and a young adult son. Prior to that move, she had served as the Vice President, and then President, of the East Suburban Unitarian Universalist Church. Just as she arrived in Mt. Lebanon, she began her first term on the Ohio-Meadville District Summer Institute Planning Committee, where she served until 1996 and then again from 2005 until 2006. 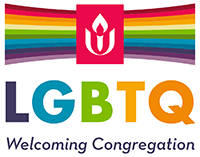 From 1998 until 2002 she was the President of the Ohio Meadville District of the UUA having served on the board as Vice President for the preceding two years. At Sunnyhill, Sibyl has served on the Board of Trustees, on one of the ministerial search committees, and on the first Welcoming Congregation committee. She is delighted that her adult children all identify as Unitarian Universalists. One of them is currently the president of his congregation, and all of her grandchildren attend Unitarian Universalist churches. Two of them came of age in this congregation and one just completed her first OWL program (as a six year old!) Sibyl is very excited to have an opportunity to serve Sunnyhill again at this exciting time in our history. Josh and his wife Tanya joined Sunnyhill in 2015. Josh grew up without a religious affiliation, and when Tanya said she wanted to go check out that little church with the rainbow flag, he didn’t think much of it. Tanya kept bringing home notes and stories about Rev. Jim’s sermons, and it quickly became clear to Josh that Sunnyhill was the place to be. Josh is a member of the Adult Religious Education Committee, and is participating in Rev. Jim’s Sermon Writing Seminar. He is excited to see this little church with the rainbow flag become a bigger church, and he is committed to helping Sunnyhill continue to thrive. Josh graduated from the University of Pittsburgh with a degree in finance. He and Tanya spent much of their twenties in Los Angeles and Chicago before moving back to Pittsburgh to start a family. Their kids, Wyatt and Lyla, are frequent participants in the RE program. Josh works as a partner of a regulatory consulting firm, and founded their Pittsburgh office just down the street from Sunnyhill. Sarah Yourd joined Sunnyhill in 2000 with her family. Sunnyhill helped raise her children and has supported her almost two decades. Sarah has served on the Caring Committee – including Chair; taught RE; served as Worship Associate; was active in bringing the Watershed series and Rain Barrel initiative to Sunnyhill, served as Chair of the Ministerial Search Committee and on the Committee on Ministry. She looks forward to the possibility of helping adjust to our new building and furthering our commitment to Social Justice. Sarah is a Nurse Practitioner in the South Hills in a primary care practice. Her children both live out of state at this point, but there is hope one might boomerang to Pittsburgh. She loves to travel, go for walks, enjoy Pittsburgh events (free is best!). Most importantly, she enjoys the warmth and deep fellowship of her Sunnyhill community. Lynne has been a member of a Unitarian Universalist Church for 35 years. She and her husband Jim, first joined Cedar Lane Church in Bethesda MD, where Lynne served as a Board member, a survey administrator (twice) for the Long Range Planning Committee, an RE parent, and a delegate to GA in 1996. In 2001, she and Jim moved to All Souls Church in DC, where Lynne was the volunteer Membership Director for three years and then served as Membership Secretary on the Board of Trustees from 2007-09. Lynne and Jim joined Sunnyhill in 2015. Professionally, Lynne was employed as a demographer, statistician and survey director for 30 years, serving in multiple federal agencies. Locally, Jim and Lynne have a daughter, Liz Dell (active at Allegheny UU Church), a son-in law, Paul, and a granddaughter Pauline. Their son John and daughter-in-law Maggie dedicated their son James at the Baltimore UU church. Mark and his wife Elizabeth came to Sunnyhill in 1997 and are raising their three children (Madeleine/Simon/Lucinda) to be UU’s. Mark has volunteered much of his time over the years in various roles including Canvas Committee, RE Teacher, OWL Instructor, COA Mentor, Snow Removal Team and recently as the Sunnyhill Hill Santa during One World. Mark has worked in many sales leadership roles over the past 20+ years and is currently employed by Citigroup. In his free time he enjoys gardening and gathering eggs from the dozen or so hens that reside at Ordale Farms.